As the store shelves fill (and are emptied) with school supplies, I am embarking on a new month of Operation Fortitude Fitness. For those of you just joining us, check out last month’s post or my beginning of 2012 post to get caught up. In summary, July was… super busy. I was disconnected for a week for a much needed vacation, then SheSpeaks and my sweet Mother-In-Love visited for a week. All of those things were huge blessings… But apparently, I can’t do it all. SMART Change #1: Operation Fort-itude Fitness. In short, my goal for 2012 is to log at least 98 miles per month via biking, swimming, running, elliptical etc to “travel” from Fort Benning, Georgia to Fort Riley, Kansas. Also, in order to stay on track with my strength training, I need to do 2,500 various reps per month. As of last update, I had logged 848.5 miles Jan-June and “arrived” in my hometown of Colony, Kansas. 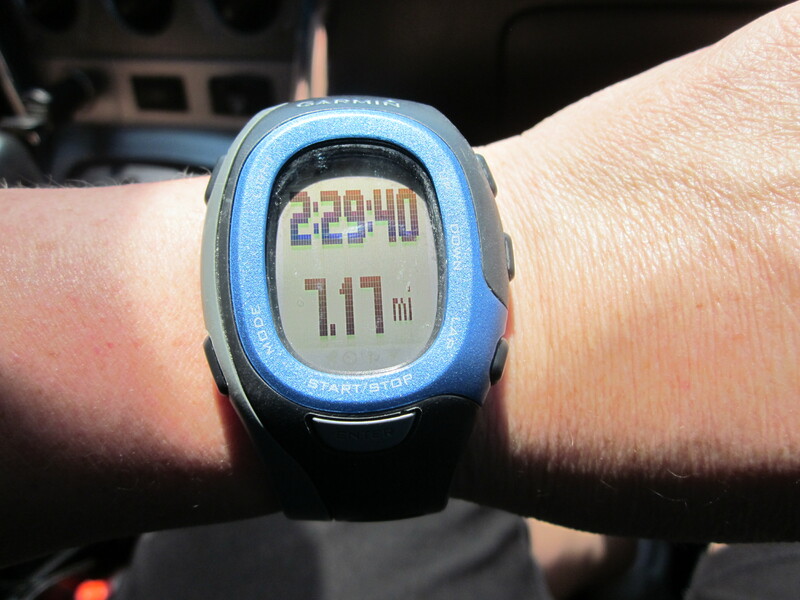 RESULT: GOAL sorta met… July in the workout department was a little bit lame sauce. Fortunately, the Lord gives me grace cards. 🙂 (Thanks for that, Jesus.) Since being gone/busy for about three entire weeks this month, I am glad I found time to work out at all. I was able to log 75 miles and have arrived in Carbondale, KS. As far as strength training– not so much. But great news… Today starts a new month. Please excuse me while I hit the reset button on my workout sched. AND GO. SMART Change #2: Spend significant time Lord’s presence by using my Jesus Calling Devotional and studying the accompanying Scripture. I will also continue to keep a prayer request list in a notebook and/or iPad. RESULT: ON GOING God really moved in this area again this month. I have still been spending time lots of time with Him, but my prayer life really grew. I have been chatting with Him, seeking Him and I can feel my trust growing significantly. So legit! SMART Change #3: Complete my 1000 Gift List (inspired by Ann Voskamp’s book) by the end of 2012. SMART Change #4: Memorize a book of the Bible, starting with 1 John. SMART Change #5: Ruthlessly Eliminate Hurry and submit to God DAILY in all areas of my life. RESULT: ON GOING This one was huge– July, although super busy, was also a month of much needed rest between vacation with my sweet husband and hanging out with my mother-in-love. I have let myself SLOW DOWN with the rush of my To Do list, allowed myself to take a nap every now and then (and I am NOT a good napper) as well as read some Christian fiction books that feed my heart but don’t exhaust my brain. This was a huge blessing this month. 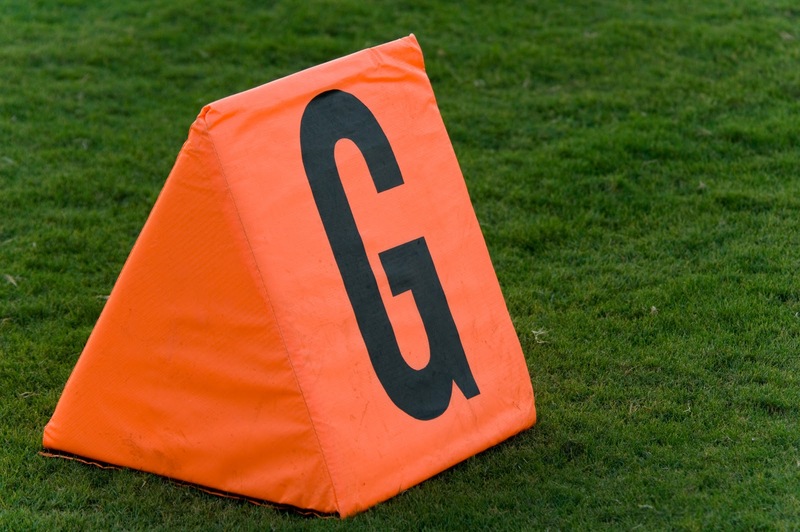 Today challenge: Are your plans getting in the way of God’s plans? What do you need to put on hold or lay aside to let God work? In what areas of your life do YOU need a grace card every now and then? Your thoughts and comments are always so encouraging– don’t be shy, share below!! Thanks to every single one of you for your cheers and prayers. It’s a new month– and I can’t wait to see what God has in store for me. Now if you will excuse me, I have a date with the treadmill. I don’t know about you all… but I’m a little sweaty. Ok, not sweaty at this very moment as I type, but I was sweaty earlier. (I showered. You are welcome.) This operation fortitude fitness business is sweaty work. Plus, it’s now July in Georgia. Yikes. Can someone hand me a towel? Back in January, you were “voluntold” to be my accountability partner. (Much easier to stick to goals long term if when I don’t achieve them I have to write in my blog “Uh, yeah, it was too hard/sweaty/I quit.) So as promised here is my monthly check-in. SMART Change #1: Operation Fort-itude Fitness. In short, my goal for 2012 is to log at least 98 miles per month via biking, swimming, running, elliptical etc to “travel” from Fort Benning, Georgia to Fort Riley, Kansas. Also, in order to stay on track with my strength training, I need to do 2,500 various reps per month. 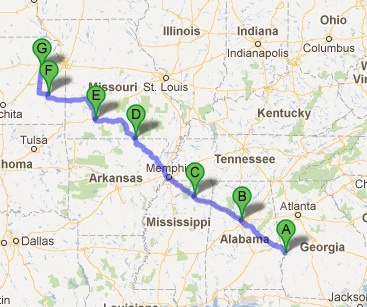 As of last update, I had logged 682.5 miles Jan-May and “arrived” in Springfield, Missouri. I logged 166 miles and “arrived” in my hometown of Colony, Kansas!! YEAH!!! ALMOST THERE! (And way ahead of schedule.) PS: Hi Mom and Dad! Did much better with strength training. I am working on my sit up/push up abilities and also started ruck marching. (Fancy army name for walking around with a heavy pack on your back.) My total strength reps for the month was 2900. Can you say sore muscles? In short: Good month. America! RESULT: COMPLETED!! Whoot! Throw some confetti, crank up the tunes! This is the first goal on my “smart change” list I have officially completed. Granted, some of my goals are ongoing lifestyle changes, but I made it to 1000 gifts this month. Oh and by completed, I mean I am continuing past 1000. I am currently at #1031. And no end in sight. Boomshakalaka! RESULT: ON GOING Um yeah, definitely experienced some breakthroughs here too… But again– I don’t to give it all away just yet… Let’s just say that my heart is more peaceful than it has ever been before due to my daily submission to Him and the fact that I am actually DOING it not just saying it. Also, I am learning to chill out a bit– and figuring out that hurrying is really overrated. Thanks to all of you who have been praying for me in 2012. It’s been a big year so far and I am excited for all that He will continue to do with myself, our family and this remarkable ministry. I would love to hear how 2012 is shaping up for you (Scale of 1-10)… leave a comment below! Is it seriously June? Last I checked, June is month #6 in our calendar, which if my stellar math skills prove correct means we are nearly halfway done with 2012… seems like just 5 minutes ago we were ringing in the New Year. I guess time flies when you are living for Jesus. But a new month means another monthly reflection of my Smart Goals for 2012. So let’s hop to it! SMART Change #1: Operation Fort-itude Fitness. In short, my goal for 2012 is to log at least 98 miles per month via biking, swimming, running, elliptical etc to “travel” from Fort Benning, Georgia to Fort Riley, Kansas. Also, in order to stay on track with my strength training, I need to do 2,500 various reps per month. As of last update, I had logged 551 miles Jan-April and “arrived” in Thayer, Missouri. Oh, and as far as the “sorta” part of this goal? Yeah, totally didn’t do much with strength training reps in May. Really gotta get back on that. RESULT: ON GOING I really lived and loved this goal in May. God’s Spirit is truly working in my life and I am watching prayers answered daily. (PS: I just received a new big kid parallel NIV/MSG study bible. I already LOVE it!) Oh, and in addition to this goal: In case you missed it, I attended the Blackaby Spiritual Leadership Coaching Conference. Talk about experiencing God in a whole new way! RESULT: ON GOING This month, I am at #941… an increase of 105 gifts from last month! I am relatively confident that I will “complete” this goal by reaching 1000 in June. But I shan’t be stopping. This is a wonderful scavenger hunt for God’s love! RESULT: ON GOING Yeah, kinda fell short on this one– Didn’t make a lot of progress as far as memorizing new stuff this month, still hovering around the 1 John 4 area… But those first 3 chapters have created some new revelations and are really starting to sink in! So yes, we are nearly halfway through 2012. Has God put any surprises in your path on your way to accomplishing your goals? How has he modified your walk with Him? I always dig your feedback– comment below. Now if you will excuse me– a 4 mile training run is calling my name. As promised, I will now update you on my personal progress for my 2012 goals… I know this might not be the most entertaining post on the planet, but let me tell you what, folks– if you want a great way to stay accountable, blog your journey and stick with it. There have been SEVERAL days over the last couple of months that I didn’t want to follow through on ANY of these goals. However, because YOU (yes, you!) are my accountability partner, I have pressed forward. SMART Change #1: Operation Fort-itude Fitness. In short, my goal for 2012 is to log 98 miles per month via biking, swimming, running, elliptical etc to “travel” from Fort Benning, Georgia to Fort Riley, Kansas. Also, in order to stay on track with my strength training, I need to do 2,500 various reps per month. 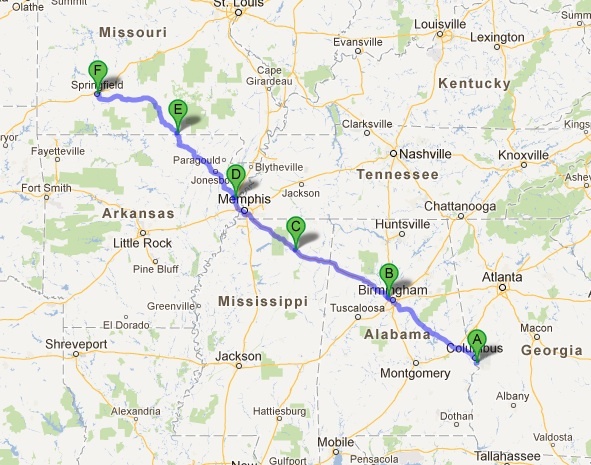 As of last update, I had logged 423 miles Jan-March and “arrived” in Turrell, Arkansas. Crossing the Missouri border! YES! SMART Change #2: Spend at least one hour per day in the Lord’s presence by using my new Jesus Calling Devotional and studying the accompanying Scripture. I will also continue to keep a prayer request list in a notebook and/or iPad. RESULT: GOAL MET (ok, kind of modified.) Here’s the thing, peeps. The first two months of this goal were INCREDIBLE. March was kind meh. Then April continued to get “routine” instead of relationship-seeking. When God called me away on my sabbatical, He spoke volumes to me. Turns out I was becoming legalistic in this goal. Instead of seeking to spend quality time with Him, my tick-tock hour was a “to do list” thing for me. So, I am still DEFINITELY doing quiet time every day and praying from my iPad prayer list app. However, I don’t look at the clock anymore. I make sure I am not rushing through it, but I am letting GOD decide how much time He wants me to chill with Him. Most days, it is still around 45 minutes to an hour, sometimes longer, sometimes shorter. The time I spend with Him each day is once again back to the quality of Jan/Feb, not the legalistic “check it off the list so I can move on” mode of March. RESULT: ON GOING I’m feeling pretty legit about this one for the month of April. I have stumbled my way to 1 John 4… It’s far from perfect and it isn’t completely ingrained in my brain, but I think by October, this will be doable in a “I-don’t-have-to-peek-at-what-comes-next” kind of way. YAY! RESULT: ON GOING Did you read my sabbatical post? Yeah. Making HUGE strides on this one by letting HIM do the hard work and me simply be the hands and feet. My soul is recharged and I am loving it! Moral of the month: Allow yourself some flexibility. Sometimes (ok, almost always) God is going to have some hidden lessons along the way, especially when it comes to your own personal goals and plans. Make sure you aren’t blazing through life so fast that you miss those lessons! What God taught you so far in 2012? Have you achieved any of your goals? How have you witnessed God moving in 2012 for you? I would love your input. Leave a comment here. Thanks for coming along… You all are AWESOME lifetrippin-cheerleading buddies! But for me, it kind of felt like the whole month was one big ol’ roaring lion. Baring it’s teeth. In my grill. Chasing me down the street. SMART Change #1: Operation Fort-itude Fitness. 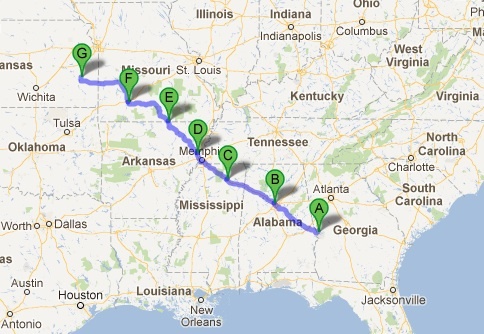 In short, my goal for 2012 is to log 98 miles per month via biking, swimming, running, elliptical etc to “travel” from Fort Benning, Georgia to Fort Riley, Kansas. Also, in order to stay on track with my strength training, I needed to do 2,500 various reps per month. 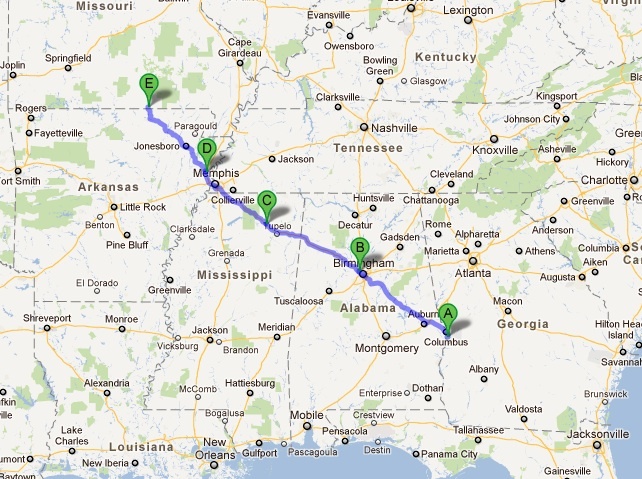 As of last update, I had logged 306 miles Jan-Feb and “arrived” in Wallerville, Mississippi. RESULT: GOAL MET… Sorta. I fell short on reps this month with only 2,100. But even with being exhausted from pregnancy and the subsequent miscarriage recovery, I did manage to still log 117 miles. Granted, most of these were walking or on the stationary bike. But I am extending some grace to myself this month (a task harder for me to do than running 5k!) and chalking March up to one of my most challenging, emotionally draining months of my 26 years on this earth. I am now Turrell, Arkansas and have traveled 423 miles in 3 months. Gonna count that as a win! America! RESULT: GOAL MET!! Honestly folks, this goal was even harder to achieve than the above physical challenge. Not only did I have company staying with us for about 12 days this month which kind of squiggled up my schedule a bit, but losing the baby didn’t help at all. I was physically, emotionally and spiritually exhausted for several days… And if I am being perfectly honest (which I always try to do in my posts) I was pretty ticked off at the Lord for a few days and really didn’t WANT to meet with Him, let alone talk to Him and spend precious quiet time together. But I did… Many days during my quiet time, I read Jesus Calling, then cried and cried at the feet of Jesus from my red recliner rocking chair. He always had something to say to me and my quiet time is helping immensely in the healing process. Plus… I still pray every day for the folks in my iPad prayer app. It helps me keep a larger perspective of God’s plan and helps me to be commune with Him. RESULT: ON GOING Uh, yeah… bout that. I made it to 1 John 3:3 (three whopping verses farther than last month) the things kind of bottomed out. Memorizing was put on a hold this month… No excuses, but considering that the day after I miscarried it took a hot minute to remember how to make a sandwich, I’m gonna play the self-grace card on this one too. So today’s moral of the story: Goals are awesome. They really are. Everyone should have some. But sometimes, we need grace more than goals. Have you been in that position before? I would love to hear you recount of grace vs. goals– leave a comment here. Thanks for all of the support, love and prayers you all have been sending our way last month. While our bodies and emotions have been tired, our faith has never been stronger and more energized. What an interesting fitness blessing, huh? SMART Change #1: Operation Fort-itude Fitness. February was Month #2. In short, my goal was to log 98 miles per the month via biking, swimming, running, elliptical etc to “travel” from Fort Benning, GA to Fort Riley, Kansas. Also, in order to stay on track with my strength training, I needed to do 2,500 various reps per month. As of last update, I had logged 160.5 miles in January and made it to Forestdale, AL. RESULT: GOAL MET!! I did 2,500 reps this month and logged 145.5 miles. This is still well above my goal (YAY!) and a little less than last month due to the physical/mental exhaustion induced by the discovery of my pregnancy, as well as chaos associated with Pre-ranger and Ranger School. 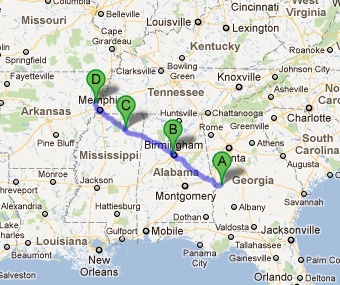 I am near Wallerville, Mississippi and it brings my total miles traveled to approximately 306 in two months. AMERICA! RESULT: GOAL MET!! I have continued with this goal and found heart refreshment and success. Jesus Calling rocks my world, and I have continued to keep up my iPad prayer request list. Since January 1st, I have logged 124 different prayers and 45 of them have been answered. (In January He answered 27 prayers and added 18 more in February.) WOW. RESULT: ON GOING At last update, I was at #422… In the month of February, I added 149 gifts to my list, bringing my total to #571. Loving this. RESULT: ON GOING Out of all my goals, this is the one I have struggled with the most this month. I kind of got a little stuck on 1 John 2:18-1 John 3… It was a lot of prepositions and whatnot, but I did make progress from last month. Excited to start fresh this month! RESULT: ON GOING Funny how God works. This was a goal that is hard to measure, but now with this Baby Knobloch in the picture, I have slowed down, talked to God WAY more than ever before and taken more naps in the last three weeks than in my entire post-college adult life combined. God is a sneaky awesome dude! I hope that February was a legit month for you and that March is shaping up well… Please let me know how I can pray for you and thanks so much for playing along on this journey! Hopefully this post finds you still moving strong towards your “Getting SMART with 2012” goals… We are heading into month #2 and I’m hopeful that you are still hanging on to your goals and have not already fallen off track like a 6-year-old trying to use their dog to pull their Red Rider Wagon. SMART Change #1: Operation Fort-itude Fitness. This was obviously month number one. In short, my goal was to log 98 miles per the month via biking, swimming, running, elliptical etc to begin my “travels” from Fort Benning, GA to Fort Riley, Kansas. Also, in order to stay on track with my strength training, I needed to do 2,500 various reps per month. RESULT: GOAL MET!! I started out slow on this one since the first week of January was super busy for my ministry… but the last three weeks I have really picked it up. I logged 160.5 miles!! 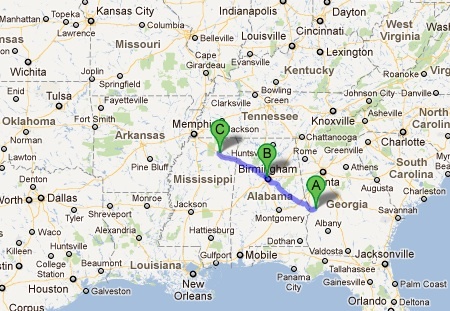 (62.5 miles over goal) This puts me at Forestdale, Alabama on my route! (For all of you non-southern readers, that is on the northwest side of Birmingham. Glad I made it through traffic in one piece.) As for reps, I completed 2,811. Oh… and I added a new 5K time improvement running plan to keep my running accountable. Totally thrilled with meeting this goal! I made it from point A to point B… Very encouraging! RESULT: GOAL MET!! I’ve been faithful to this goal… and man oh MAN has it been amazing!! God has done a HUGE work on my heart so far and I have fallen head over heels deeper in love with Jesus. (Side note: Stay tuned in the next couple of weeks for some new, big, and exciting ministry changes coming!) Oh, and can I mention that He has already answered 27 prayers just in this month? RESULT: ON GOING I’m not at 1000 yet, but since my first post, I have doubled the number of gifts on my list. As of today, I am at #422. I’m swimming in a sea of gratitude. Amazing. RESULT: ON GOING Honestly, I am really excited and pleased how this goal is going. Out of all of them, I thought this would be the most challenging. Yes, it has been challenging as the NIV84 format of 1 John is what I have now deemed the book of “excessive pronouns and prepositions.” I have learned a ton and made it all the way to 1 John 2:18. Very pleased with my progress. RESULT: ON GOING Again, it’s kind of hard to measure this goal… It’s probably something I am going to have to focus on the for the rest of my life. BUT… The extra time in prayer and reliance on Him has been evident that there is work being done in my heart.